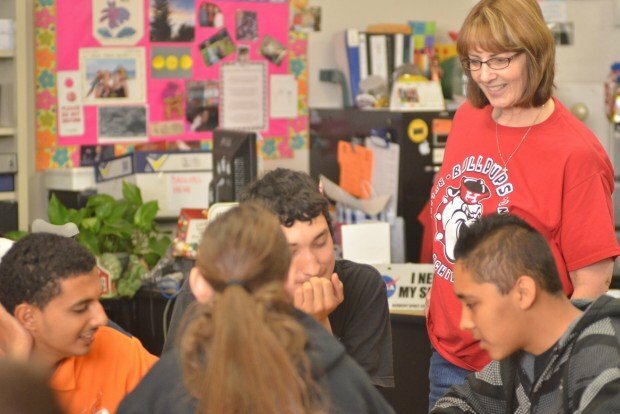 HANFORD — It’s not every day that a single high school can lay claim to the county’s top teacher and administrator. Hanford High School Principal Cheryl Hunt and teacher Carol Smith were named the 2012 Administrator of the Year and Teacher of the Year, respectively, at the Kings County Office of Education Excellence in Education program this month. 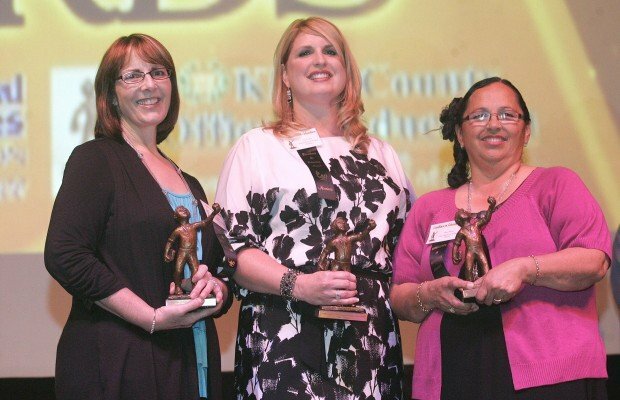 Nominees for teacher, administrator and employee of the year came from school districts across Kings County. The nominees had to secure letters of recommendation and write out their philosophy on education. Somehow or another, all three finalists from the Hanford Joint Union High School District came from Hanford High School. Hanford High teachers have now won the honor 15 times in the last 30 years, more than any other school. The school also received both of the teacher and administrator awards in 2007. Both women attributed the high school’s success to a sense of community among students, parents, teachers and administrators. Hunt, herself a Hanford High graduate, got her start in education 18 years ago at Corcoran High School. In 1998, she got a chance to teach at her alma mater. After earning her master’s degree and administrative credential, she became assistant principal and finally principal in 2007. Smith has spent her entire 32-year career with the same district, teaching special education, at-risk students and mathematics. She said she developed her teaching philosophy when she became a parent. Hunt said she sees education as a way to serve others. “It’s all about serving our students in the best way possible and make those connections with students so that they’re able to be successful and achieve the goals that they set for themselves,” Hunt said. With a background teaching chemistry and biology, Hunt said, her approach is more hands-on. Teachers need to be aware that students are constantly active. As a teacher, Smith said the most important part of her job is keeping students engaged. Instant communication makes information easier but has shortened attention spans, she said. One of the biggest compliments she gets in her class is when a student is actually disappointed that class is over. Also recognized at the Excellence in Education ceremony was the Classified Employee of the Year, Olivia Muñoz, who serves as Kettleman City Elementary School’s migrant aide. The reporter can be reached at 583-2458 or meiman@HanfordSentinel.com.